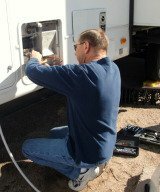 These photos of a Winnebago Rialta Motor Home were taken in an Apache Junction RV Park. It looked quite comfortable among the larger RVs in the park. 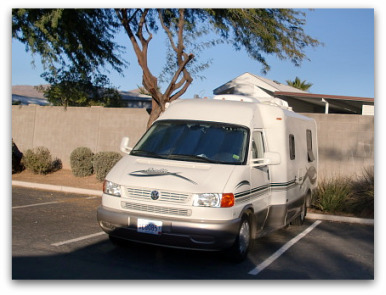 These RVs are sometimes referred to as Class C motor-homes, and sometimes as a B-Plus motor-homes depending on the style of the model. They are always popular because they are completely self-contained yet small enough to offer high fuel mileage generally getting between 18 to 21 mpg. They are very aerodynamic, and easy to handle on the road. About 8,000 Rialta motorhomes were built by Winnebago from 1994 through 2005, but the use of the Volkswagen Rialta chassis was discontinued in 2003. If you're looking for a used Rialta motor home it can run you anywhere from from $20,000 to $50,000 depending on mileage and condition. With its 2.5L fuel injected Volkswagen gas engine and slick design it gets good fuel mileage and has a nice towing capacity. The Volkswagen Rialta has independent suspension, rack-and-pinion steering, and an antilock braking system. The interior of the rialta RV has all the comforts of home including many driver conveniences. Standard equipment includes cruise control, power windows, power mirrors, air conditioning and storage below the front seating area. The galley of the Winnebago Rialta has a flip-up counter extension, microwave oven, two burner range top stove, single door 3-way refrigerator, and a stainless steel sink. The bathroom is equally well equipped with cabinets, shower, sink, marine style toilet, towel bar, and a fold-down vanity shelf. Most Rialta motorhome models include entertainment centers with color TV, cable ready, and a CD player. There are also monitoring system panel for the holding tanks, LP levels, battery gauge, and a generator start switch and all the standard safety equipment. 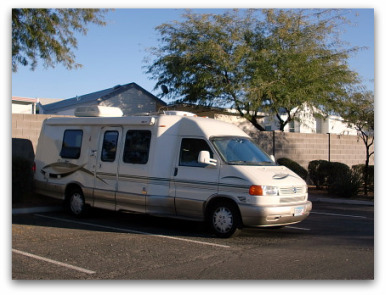 The Winnebago Rialta motor home is used for full time RVing, or long term RVing if you're looking for a small motorhome.